Dimensions : 11 1/4 in. x 11 3/8 in. x 11 1/8 in. 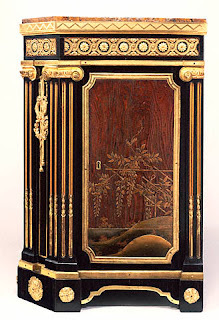 The combination of rare and expensive materials used on this Louis XV cabinet indicates that it was a particularly expensive commission. The four Japanese lacquer panels date from the mid- to late 1600s and were created with a technique known as kijimaki-e. For this type of lacquer, artisans sanded plain wood to heighten its strong grain and used it as the background of each panel. 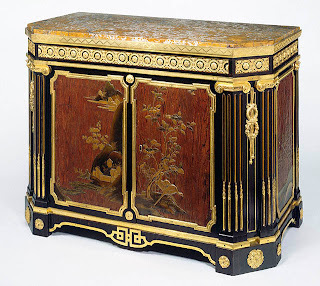 They then added the scenic elements of landscape, plants, and animals in raised lacquer. 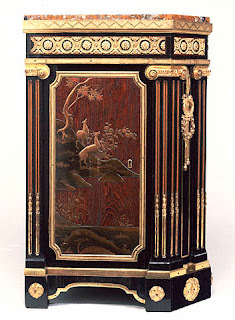 Although this technique was common in Japan, such large panels were rarely incorporated into Antique French eighteenth-century furniture. 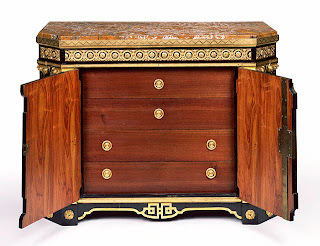 see also louis XVI Secretary as and example of using this type of antiquing technique. Heavy Ionic pilasters, whose copper-filled flutes give an added rich color and contrast to the gilt-bronze mounts, flank the panels. Yellow jasper, a semiprecious stone, rather than the usual marble, forms the top.